JEFFERSON - Last week, Ashtabula County Treasurer Dawn Cragon was elected president of the County Treasurers Association of Ohio. “Our association is dedicated to finding or creating the best ways to be your county investor, banker and tax collector. We have a very active legislative committee and an awesome legislative activist to ensure our voices are heard. I am proud to lead this group in 2019,” Cragon said. Cragon said 2019 will be her first year as president of the County Treasurers Association of Ohio. “By vote of my 87 peers, I was elected to the position of Secretary for 2017 and Treasurer for 2018. When the County Treasurer who was slated to be President in 2019 won her election as Montgomery County commissioner, my association voted me in as President on Tuesday, Nov. 13, 2018 and I was sworn in on Nov. 14, 2018 in Dublin, Ohio, at our fall educational conference,” Cragon said. Cragon said the president oversees all association meetings and conferences, presides over the Executive and Legislative Committees and is an Association voting member of the Ohio Council of County Officials. The president selects all of the committees and members to serve under each committee and also chooses the location of the educational conferences. Cragon is working on a plan to bring everyone to Bridge Street for an evening of fine dining during the conference. “And my colleagues have requested a winery/distillery tour as an activity option during their stay,” Cragon said. 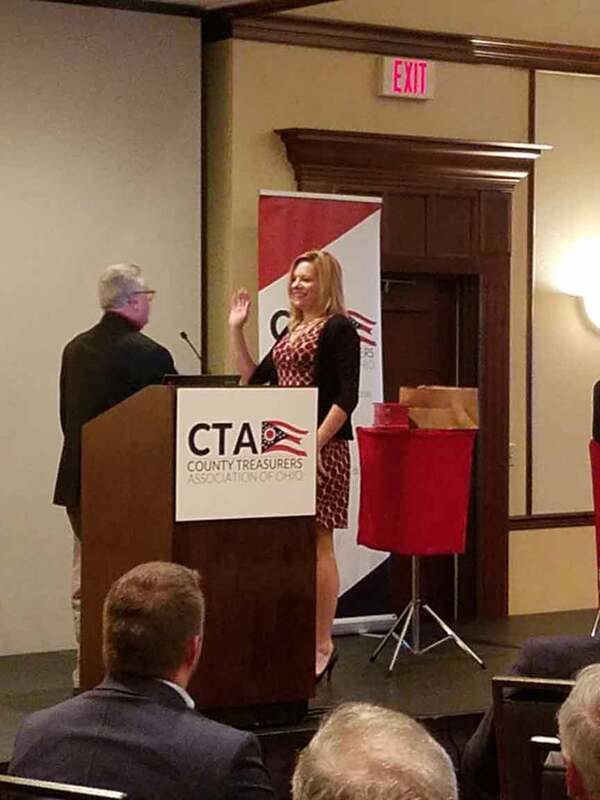 Ashtabula County Treasurer Dawn Cragon was sworn in as president of the County Treasurers Association of Ohio last week.